Not to be confused with Westminster Abbey, the nearby Westminster Cathedral in Victoria is London's only example of neo-Byzantine architecture, described by the poet John Betjeman as a "masterpiece" of craftsmanship and the last great building to be made of brick. 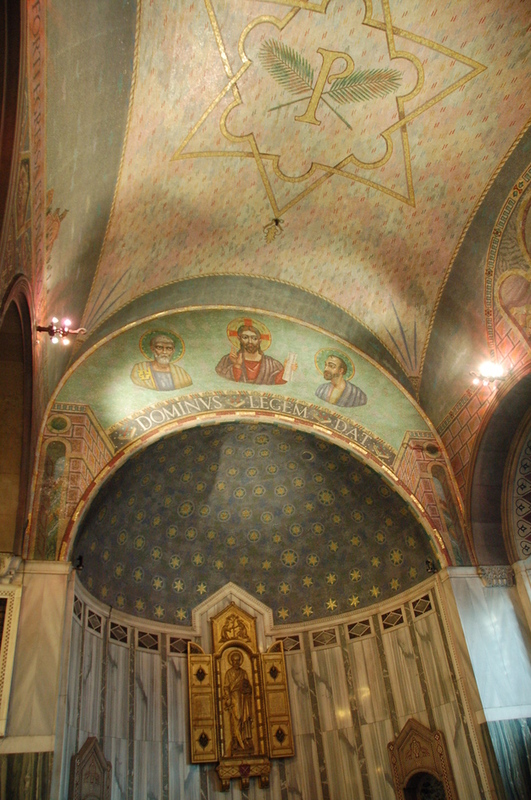 The only church in England to have had visits from two Popes and the Queen, Westminster Cathedral is London's principal Roman Catholic Church and was opened in 1903 although John Francis Bentley's astonishing basilican structure remains incomplete today. The cathedral boasts a magnificent campanile that emerges 274 feet into the sky, and was made famous by a vertiginous scene in Hitchcock's 'The Foreign Correspondent'. While 12.5 million burnished terracotta coloured bricks adorn the exterior, parts of the interior remain poignantly bare - a potent reminder of the lack of funding which plagued the start of construction in 1895. Plain walls and simple candlelight form a stark contrast to astonishing array of colourful mosaics and marbles (129 types from 25 countries on five continents), as well as Eric Gill's nave detailing the fourteen Stations of the Cross. Unlike Westminster Abbey, the Cathedral is free for anyone to enter. For £5 guests can walk or take the lift up the campanile for some spectacular views of the capital. While being as good a free museum as London has to offer, the Cathedral is perhaps best known for its distinguished choral tradition. It's the only Catholic cathedral in the whole world where both vespers and mass are sung every day. The boys' choir is one of the best in the world and hundreds of people gather to listen to free Renaissance concerts each day. What are the best dining options near Westminster Cathedral London? Westminster Cathedral gyms, sporting activities, health & beauty and fitness. The best pubs near London Westminster Cathedral. Westminster Cathedral clubs, bars, cabaret nights, casinos and interesting nightlife. Where to have your meeting, conference, exhibition, private dining or training course near Westminster Cathedral. From cheap budget places to stay to luxury 5 star suites see our deals for Westminster Cathedral hotels, including Park Plaza Victoria Hotel London from 84% off.